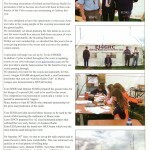 Blog | Galway Radio Experimenters Club EI4GRC | HAM Radio in the west of Ireland! VOA and BBC World Service announce reductions to their shortwave schedules. See VOA transmission schedule, 31 March 2013 through 26 October 2013 (not available at voanews.com). This schedule is for transmissions through IBB-owned shortwave and medium wave transmitters and does not include broadcasts that are through partner stations in target countries. This should be active for some time. If not look under past editions. This is the article posted in Echo Ireland about our special event station during the Volvo Ocean Race 2012 stopover in Galway. Please click on the picture for a large version. I Know that the time for this test is past but non the less makes for an interesting read. Radio amateurs use several modes to transmit text via shortwave. It occurred to me that text via shortwave might be a workaround where the internet is not available because of disasters, dictators, or other causes. I have not yet convinced any major international broadcasters to let me test this hypothesis on their (remaining) shortwave transmitters. However, the Netherlands-based Mighty KBC has kindly been allowing me two one-minute segments during their broadcast to North America at 0000 to 0200 UTC on 9450 kHz. This is via leased time on a transmitter in Bulgaria. Reception of text via shortwave is possible on an inexpensive shortwave radio, even one without single sideband (SSB) capability. The audio is patched into a PC that does not have to be especially powerful. This involves a patch cord from the earphone jack of the radio to the microphone input of the PC. If there is no patch cord, placing the radio’s speaker near the built-in microphone of a laptop might work. Software for decoding the text should be installed in the PC. There are several available to radio amateurs, including DM780, MixW, and MultiPSK. Especially popular these days is Fldigi. This is available from www.w1hkj.com. While you are there, please also download Flmsg, because it will be needed for this weekend’s test on KBC. This weekend’s test on KBC will feature the MT63 modes with long interleave. After Fldigi is installed, go to Configure > Modems > MT-63 > check 64-bit (long) interleave, 8-bit extended characters, and Allow manual tuning. Also, go to Configure > Misc > NBEMS > check Open with flmsg and Open in browser and, below that, indicate where your flmsg.exe file is located. The first KBC text transmission will be around 0130 UTC Sunday (Saturday evening 8:30 pm EST). The MT63-1000 mode with long interleave will be centered at 1000 Hz on the waterfall visible on the software display. PSKR125 will be cenetered at 2200 Hz. Decode one while listening, and decode the other from your recording of the transmission. The second text transmission will be just before 0200 UTC Sunday (9 pm Saturday EST). This will be MT63-2000 centered at 1500 Hz. This message will be formatted for Flmsg. If all goes well, the shortwave transmitter in Bulgaria will open a new window of Flmsg and then open a new window of your web browser with formatted content, in color no less. One week after my first text transmissions (11 November) on KBC, Arnie Coro at Radio Havana Cuba began transmitting digital text modes on his Dxers Unlimited program (in English). He might do so again this weekend. The schedule for DXers Unlimited can be found at the World of Radio website (where all times and days are UTC, so those UT Monday transmissions are actually Sunday evening in North America). More discussion of the concept of digital text via analog shortwave broadcast is in Kim’s December 2012 column (pdf) for the North American Shortwave Association. Update from Kim: My own reception The Mighty KBC in northern Virginia was lousy, and my decoding efforts were mostly unsuccessful. I was feeling despondent and was ready to declare failure. Another perfect Flmsg image came from Manassas, Virginia. Others, in various locations, reported successful reception of the text. So we may be on to something. In internet emergencies, shortwave might be able to come to the rescue. General “Let him no longer tolerate the law of the jungle”. The press fulminated, the enthusiasts were frustrated, and the radio manufacturers fumed. Despite the fact that Marconi had invented radio before Queen Victoria had celebrated her Diamond Jubilee in 1897, radio in Britain took another 25 years to begin an official service to listeners. But when, on November 14th 1922 the British Broadcasting Company’s station at Marconi House radiated to an awaiting nation “This is 2LO calling” for the first time under the company’s name, it marked the start of the first and most distinguished public-service radio station in the world. As part of the celebrations to mark nine decades of the BBC, historian Dominic Sandbrook explores the long and involved pre-BBC history of radio in Britain, how Britain’s broadcaster got going and developed into an institution dedicated to entertainment, education and information, discovers why Australian diva Dame Nellie Melba was involved, and how the improbably-named Captain Plugge made his first British commercial broadcast from the roof of Selfridges department store in London. From Marconi to Savoy Hill via an old army hut in Essex, the story of the early radio in Britain. tell the story of this real life “Passport to Pimlico”.